Kitchen jacket There are 8 products. 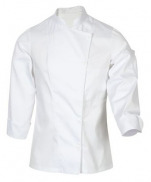 White kitchen jacket 65% polyester and 35% cotton, 210 gr/m². 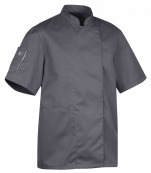 Kitchen jacket collar, long sleeves, closing stainless-steel press studs and double breasted, slightly waist fitted, a left inner breast pocket, a small pen pocket on left sleeve, finished with rounded open wrist that could be 3/4 sleeves. Very elegant model for men and women. 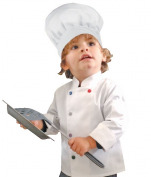 White children's chef jacket. 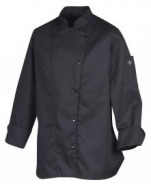 Chef jacket with rounded mandarin collar, covered et colored press studs, pen pocket on sleeve. 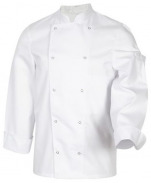 Children's chef jacket long sleeves, in polyester/cotton, 210 gr/m². Available in sizes from 2 to 4 years and from 10 to 12 years. The jacket is sold separately from the white hat. Unisex tunic with stand-up collar, short sleeves, attached by snaps and splits on the sides. White tunic in 65% polyester and 35% cotton, 215 gr/m². 3 Pockets have an extendable gusset (fold at the bottom) providing extra space. Length size M = 76 cm. Available from size XS to XXL. 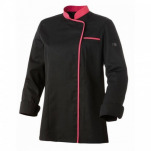 Jacket Mixed kitchen NER, 67% polyester and 33% cotton, 195 gr/m². Closing side by hidden press studs. Straight neck and rounded edge. United jacket with beige colored trim and small logo on pen pocket on left sleeve. Inside breast pocket. Short sleeves. Slightly fitted and under arm vents. Washable at 75°C and resists drying.